We’ve all been there, working on a kit and then SNAP, a piece breaks. Not to worry, this store in Akiba have you covered. 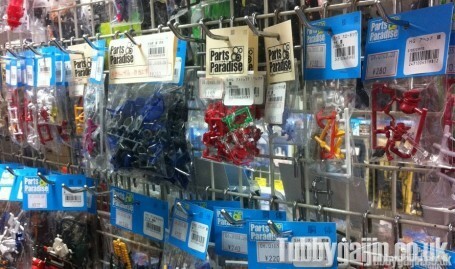 This is Parts Paradise, here you can get plenty of spare bits to fix up your Gunpla. Pieces are bagged up by kit and body section – so if you need a new V-fin you’ll be buying all the parts for a head, but prices are reasonable and much cheaper than buying a whole new kit! Repairs aren’t the only reason to buy spares though, they’re great for modding too. Maybe you want to give Exia 2 heads, or Astraea Type F more guns(as if it doesn’t have enough already). 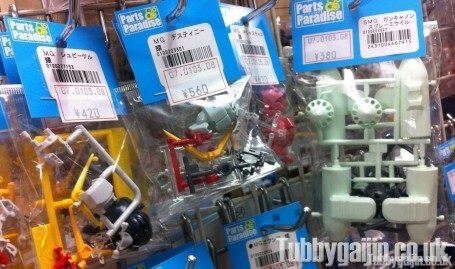 Parts Paradise is located in G-Shop, on the 5th floor of the Yellow Submarine building in Akihabara, it’s big, yellow and very hard to miss! Map below. i’d be like a kid in a sweet shop in there. any chance you can post some pictures,during your travels of what the inside of a proper japanese model shop looks like? i’d give my eye teeth(and sell both kids) to get the chance to spend a few hours in one…. Hey, when I’m back in Kansai I absolutely will get some pics! 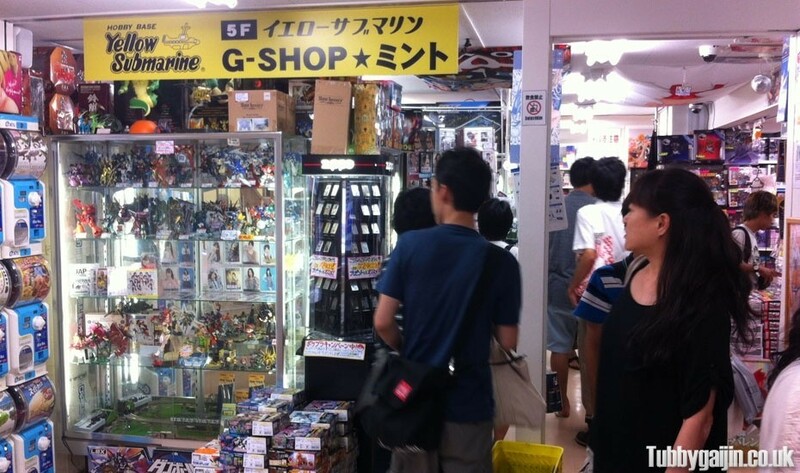 Small hobby shops don’t really exist anymore, but places like Yodobashi and Yellow Submarine have dedicated Gunpla floors with tons of tools, paints, decals and modding items. Laox Hobby also do electroplating but it’s bloody expensive! i wanna buy the strike gundam’s shield RG 1/144 how can i buy it online? Is there anyway to contact this store? I wanna know if I can ask them for parts and to possibly get a quote for how much the parts would cost me. I wanna be able to build custom Gunpla without having to waste money buying models just to get the parts I need. Hi, May I know if I can purchase the spare parts online and have them mailed to me as I stay outside of Japan? Is there a catalogue for them? Hey everyone, as far as I’m aware these guys don’t have any way to buy online, or a catalogue. They don’t really follow a set system, breaking up kits and stocking what they have for a limited time. If you’re after specific parts you should get in touch with GG Infinite as I’m pretty sure they have a replacement parts service – http://gginfinite.com, good luck! Is there an order link for parts or a phone number to call for parts? Sorry, store only 🙁 I’d love an online parts ordering service!